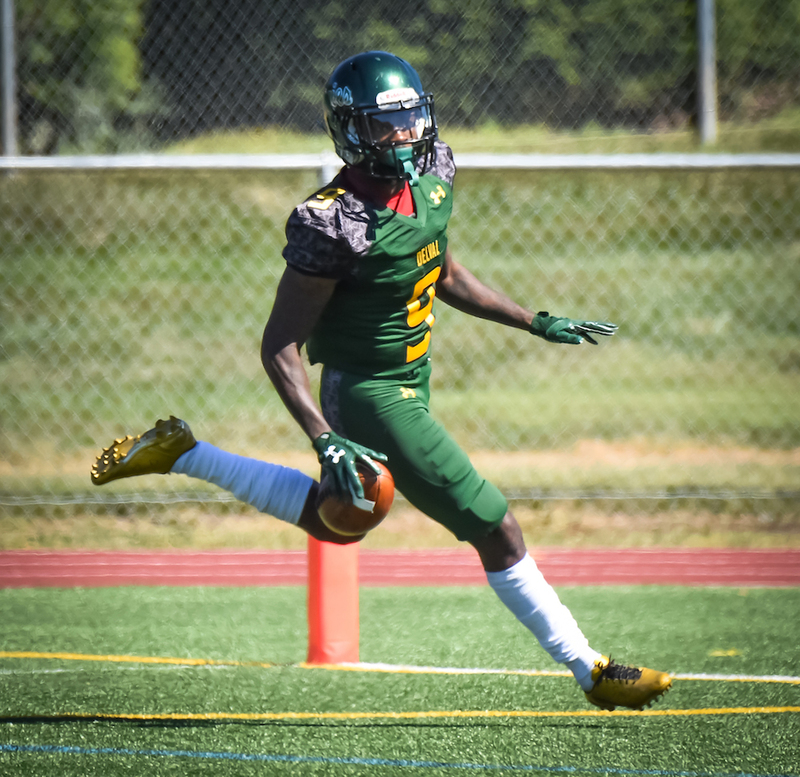 DOYLESTOWN (PA) – Delaware Valley University junior quarterback Dashawn Darden threw four touchdowns passes and caught one as well as the sixth-ranked Aggies remained undefeated with a 49-14 victory over Middle Atlantic Conference (MAC) foe King’s College. DelVal improved to 7-0 overall and 6-0 in conference play as it heads into its bye week (will host Lebanon Valley College on October 28). Widener University (5-1 MAC) and Albright College (4-1) are the lone one-loss teams in the MAC standings (Albright beat Widener in September). The Aggies defeated Albright last week and end the regular season at home against Widener. DelVal dominated both sides of the ball in front of a large Homecoming crowd. The offense racked up 637 yards with 397 in the air and 248 on the ground. The unit had the ball for more than 37 minutes in the contest. Darden led the charge as he completed 17 of 34 passes for a career-high 357 yards (ninth-highest, single-game total in school history) and scoring tosses of 11, 38, 17 and 27 yards. He also rushed eight times for 40 yards and caught a 25-yard touchdown. Meanwhile the Aggies defense, which entered the day ranked fourth in Division III in points allowed (9.3 average) and 15th in total defense (245.1 yard average) permitted just 232 total yards (162 passing, 70 rushing) and forced three turnovers. After a sluggish start on their first three drives of the game, the Aggie offense came alive when Darden hit Khalil Steward for a 77-yard pass to the Monarch three-yard line. Two plays later, Devauntay Ellis found his way into the end zone from two yards out. Colin Fasolka added the extra-point for a 7-0 lead with 4:45 left in the first quarter. Later in the quarter, Darden found tight end Dan Allen in the end zone from 11 yards out. The 45-yard scoring drive was keyed by a 31-yard catch-and-run out of the backfield by Khalil Roane. Fasolka’s boot upped the score to 14-0 with 1:19 remaining in the first. King’s (3-4, 2-4 MAC) went three-and-out on its next drive and the Aggies took over at their own 43. On a third-and-two, Ellis sprinted 43 yards before being tripped up at the Monarch six-yard line. Ellis took the next handoff and went in for his second touchdown of the day and a 21-0 advantage just 90 seconds into the second quarter. DelVal added two more scores before halftime for a 34-0 lead. The first came with 10:26 to go and shortly after the Aggie defense stopped King’s on a fourth-and-one from the Monarch 38. They faced a fourth-and-10 when Darden hit LaQuille Nesbitt for a touchdown. Then, with 2:54 to go before the intermission, an 11-play, 95-yard scoring drive was capped by a 17-yard scoring strike from Darden to John Graham. The Monarchs got on the scoreboard with a three-play, six-yard drive after Malcolm Johnston recovered a muffed punt return. On third-and-goal from the seven, quarterback Zach Whitehead found Marquis Miller open in the end zone. Mike Tumminello’s extra-point made it a 34-7 ballgame three minutes into the second half. A short kickoff and a 29-yard return by Vinnie Nelson, gave the Aggies the ball at the King’s 45. Two plays later they were at the 25 when Darden threw behind the line of scrimmage to Roane, who threw back to Darden and the signal-caller went into the end zone untouched. A Vian Dolo two-point conversion run upped the advantage to 42-7. Both teams scored touchdowns in the fourth quarter. Darden completed his big day by hitting Aaron Nelson for a 27-yard scoring toss with 11:15 remaining while Whitehead snuck in from a yard out with 8:20 to go for King’s. Ellis ran the ball 21 times for 131 yards and two touchdowns. The senior, who is in his third season with the Aggies, also became the eighth running back in program history to surpass the 2,000-yard mark for a career (2,054). Nesbitt caught four passes for 77 yards and a score while Roane had 73 yards on four grabs. Preseason All-American safety Shawn Miller led the defensive charge with six tackles and two interceptions. Vincent DiLeo had four stops and 2.5 sacks while the remaining interception was by Jalen Mayes. Whitehead finished the day 16-for-42 for 160 yards, one touchdown and three interceptions for King’s. Miller caught six passes for 70 yards and a score while Tyler Marroni notched six receptions for 67 yards. Three players had eight tackles apiece to lead the Monarchs.